Tailgate is a new cultivar from Seminis. First time entered into our evaluation in 2018. Tailgate had the top yield variety in the 2018 trial. It produced large-sized fruit, average fruit weight was 18.5 lb, 37% fruit in 36 counts and 20% in 30 counts category. Firm flesh, good quality. Tailgate was one of the five cultivars that did not have hollow heart fruit among the 12 fruit selected for the quality test. Bottle Rocket had a consistent high yield in both 2017 and 2018 trials. Average fruit weights were 15.8 and 17.4 lb in 2017 and 2018 trials, respectively. Firm flesh, good quality. Bottle Rocket was also one of the five cultivars that did not have hollow heart fruit among the 12 fruit selected for the quality test. Excursion has been evaluated in our trials in the last years, and it consistently had a high yield. Excursion also produces large size fruit, average fruit weight was from 17.4 to 17.7 lb. More than 50% fruit in 36 counts or 30 counts category. Excursion was an early ripening variety, it consistently had higher yield in the first harvest. Red Amber was evaluated in our trials in 2017 and 2018, and had a high yield in both years. Average fruit sizes were 16.6 and 16.1 lb. About 40-45% in 45 count category, and 30-35% fruit in 36 or 30 count category. Traveler was in our evaluations since 2013. It had high yields in 2015, 2016 and 2018. In 2015, the watermelon variety trial was affected by Fusarium wilt that affected the yield of several cultivars. While Traveler had a relatively higher yield. Traveler had smaller size fruit compared to other top yielding cultivars. Average fruit weight ranged from 12.9 to 15.1 lb, most fruit in 60 or 45 count category. Embasy was in our evaluations in the past three years and it consistently had high yields. Average fruit weight of the cultivar ranged from 14.6 to 16.7 lb, majority fruit in the 45 count category. 9651 was a sugar baby type watermelon that has solid green rinds. Fruit shape is round to oval. It had a consistently high yield in both 2017 and 2018 trials. Average fruit weight was 17 lb in 2018, and 15.7 lb in 2017. It is generally agreed that the ideal size of mini watermelons is about 6-7 lbs. 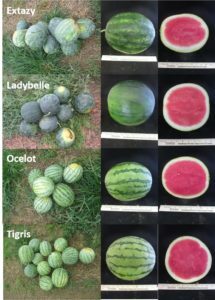 In the past three years, we found the top yielding cultivars in this group often produced 20-30% fruit with larger sizes that may prevent them from being marketed as personal (mini) size watermelons. Examples include cultivar Extazy, Sirus Mini, Tigris, and Krimson Kiss. Ladybelle is a promising cultivar in our trial in 2018. It had a comparable yield (by weight) as cultivar Extazy, while it produced more fruit with smaller sizes and thinner rind compared to Extazy. Figure 1. 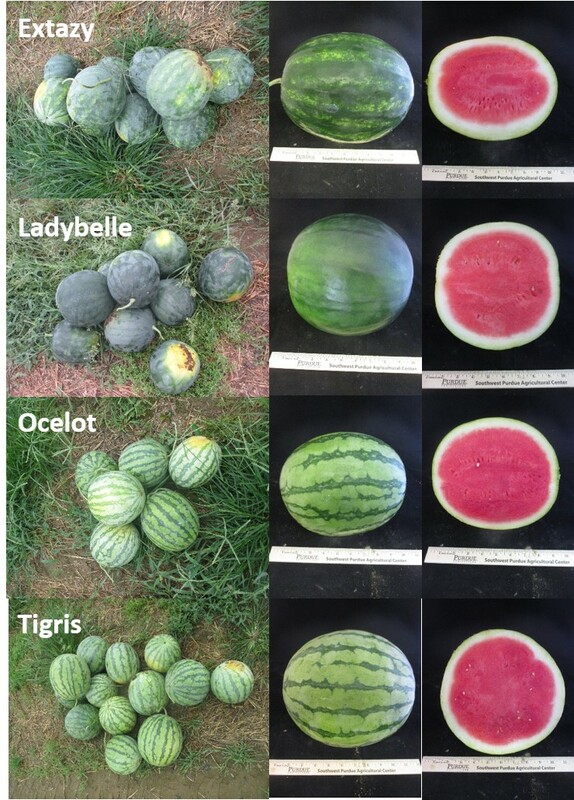 Standard size seedless watermelon cultivars. Figure 2. Personal size (mini) watermelon cultivars.